The worst cravings are at the beginning. You find out you have to live with food restrictions, and you can’t figure out what to eat because all you can think about is what you can’t have. You create mental lists of lamentations in your head over what you’ve lost. Your stomach feels hollow in a way you can’t quite describe or even understand—even when you’re full. You try making foods with substitutions, but you find the flour choices overwhelming, or you just can’t get out of your head a texture that you are trying to achieve, but can’t. Even if you aren’t a prepackaged kind of person, you try out premade mixes and processed foods hoping to recreate a favorite. They may taste good, but they usually don’t taste quite right, and you think, Is this what I’m stuck dealing with for the rest of my life? It gets better, maybe even faster than you ever thought it could. Given some time for acceptance and for your taste buds to evolve, you start to forget what you’re missing. Even forgetting is a bit sad—you’re losing a bit of your history, and part of your cultural connection to so many other people—but it’s also a pleasure to be able to taste foods and enjoy them for what they are instead of focusing on what they aren’t. You push yourself to be adventurous, to try grains, proteins, vegetables that you’ve never tried before, and you really love some of them—things you never would have tried if it weren’t for life making you. You get more adept at using the alternatives, and start to make tasty food again. Maybe you learn to like foods you previously couldn’t stand because you think you don’t want any further restrictions than you have to have. You’re different from others, and being set apart can be lonely (and maybe always will be at times), but you can enjoy what you get, too. Few things in life have to be black-and-white, and this situation is no exception. So you can imagine, I woke from my dream completely thrilled at the new croissant recipe discovery. I awoke and immediately sat up, ready to jump out of bed and put the recipe on my blog . . . when I realized that I was in bed: there was no recipe; there was no gluten-free, soy-free, dairy-free, egg-free croissant. The sadness I felt mingled with amusement over my dream and pleasure at my brain’s ability to retain, years later, exactly how a good croissant would taste and feel in my mouth. Who knows? Maybe I will get to have one some day, as I was able to have (chocolate-dipped!) biscotti again when Cheryl so sweetly conjured up a fabulous gluten-free, soy-free, dairy-free, egg-free version to send me after I had surgery last summer. When I rediscover what I thought might be lost for good, I don’t take it for granted. The pleasure of having something returned to you that was once lost is sweet indeed. Thus it was that I decided recently, after two years of craving PF Chang’s Orange Peel Chicken/Tofu/Beef, that I certainly should be able to make a reasonable facsimile of the dish at home. Croissants? Very difficult. An Asian sauce? Totally doable. I cobbled together recipes from the internet, subbed out the foods I can’t have, and voila, it actually worked well. My husband says this recipe tastes just like PF Chang’s Orange Peel Chicken, whereas I think it’s not perfect yet—but it sure did hit the spot in my heart that has held on to that craving for this long. The sauce recipe is vegan if you sub in tofu for the chicken and tamari for the fish sauce—Orange Peel Tofu was my actual favorite when I could eat it, but I have to make do with chicken now. Yum either way. Heat oil on medium. Add garlic and green onions. Cook one minute; then add tomato sauce and water. Add the rest of the sauce ingredients, and bring to a boil. Simmer 5-6 minutes, or until sauce thickens. Turn off stove. Heat oil on medium-high heat in a frying pan (preferably non-stick). While oil is heating, dredge chicken pieces in a mixture of the cornstarch and flour. Put the chicken pieces in the pan, making sure they all have a bit of space around them. (You may need to do two batches.) Fry the chicken pieces about 2 minutes; then flip the pieces, and fry two more minutes. Put the chicken on a plate covered with paper towels or paper to drain the grease. Cook the next batch, if there is one. Dispose of the oil in the pan. Scrape out any large bits of breading in the pan. Put the pan back on the stove. Put the chicken and julienned orange peel back in the hot pan. Stir gently for 30 seconds. Add sauce to the pan. Stir together until heated through. 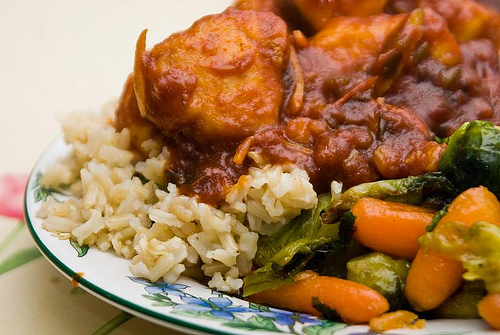 Serve over brown rice, with additional Sriracha for those who like foods spicy. My favorite side dishes to combine with this are steamed garlic snap peas and sauteed carrots. I was just wondering what I was going to make for supper tonight, and this is going to have to be it. I am so grateful that I have all of the ingredients and will not have to to the store in the torrential rain that we’re getting! Wow, that was good. We used thetofu and tamari suggestions, and it tasted great. And the recipe was very easy and quick to make. 3 Tbsp. of Sriracha was too much for us though! This sounds great. I’ll have to try it soon. Your croissant story makes me want to spend months in a test kitchen trying to figure it out for you. Oh am I glad to know I’m not the only one who has food dreams. I love the looks of this recipe though, and think I”ll try it with tofu this month once school settles into it’s usual chaotic state. Thank you! I have longed to try Kate’s croissant recipe, but all that dairy does not bode well for success for me. Perhaps this summer I will get in the kitchen and see what I can achieve. In the mean time, thank you for this great recipe! I totally understand the sadness. I seem to be intolerant to all my favourites. Nothing that I really don’t like, just everything I really really do. Your Orange Peel Chicken sounds delicious and I’ll keep my fingers crossed that one day there’ll be a gluten free, dairy free, soy free, egg free croissant for you somewhere! Sally, you’re so sweet! I’m glad you enjoyed the croissants. For me, I miss baklava the most because my grandma made it for me, and it’s a cultural thing. I probably COULD do it gf and vegan, but when I start thinking sugar free too…well, I’d rather just leave it perfect in my memory. I remember how things taste amazingly well! Hi Sally! I am sorry, but I could not find your e-mail address, I just wanted to say that I really love your story, and your blog. I have just added it to the GlutenFreeFox search engine, it is a customized Google search engine that we have built to help gluten sensitive people like us find better search results. I am going to enjoying making this. I will however, have to remove a few ingredient myself. I have an onion allergy (sad to say) the only saving grace is that I have not tested positive for a garlic allergy. I am always searching and hoping for a nice treat. If we go out to eat, say for Chinese! It’s white rice, steamed veggies, chicken or beef with yep sauce on the side! I love roaster sauce by the way it is wonderful. i enjoyed your story.. it helps so much to know that so many other people are struggling in their kitchens (in the beginning..) especially when you can’t have gluten, dairy, eggs, or soy. i started a blog with no processed sugar and many recipes are grain free all together. sometimes i think about others who have allergies to healthy things, like leafy vegetables, onions, or the color red (i knew a girl once..) and it makes me grateful for the foods i am still allowed to eat, and for the fact that i even have access to these foods at all.. It looks and sounds delicious! I sure miss Asian Cuisine a lot. I also wanted to let you in on a little secret I found a week or so ago while poking around Whole Foods. Coconut Aminos from http://www.coconutsecret.com/index.html. Talk about tasting almost EXACTLY like soy sauce. Of course it’s been over a year so maybe I just forgot but it’s soooo close. Give it a try!